Friday was my fiancé’s birthday and I let him decide what sort of sweets he wanted. We’re not really cake people, so I wasn’t too surprised when he asked for lemon bars instead. The one, slight problem? I have no experience with lemon bars, none, not even eating them, as I’ll opt for chocolate instead, every time. Not a big deal though, I simply had to find some recipes and do as I’ve done before, taking what I want from each to make my version of lemon bars. First up, I made the dough. It was quite simple, butter, sugar, flour and a teensy bit of salt. Room temperature butter is hard to come by lately, but when the mixer is the one doing the creaming, I don’t mind. Pressed it into an aluminum pan (my pyrex was busy) and put it into the oven. As it baked, I noticed it sliding down the sides, so I took the back of a spoon and pressed it up again. Didn’t bake as quickly as I expected, but I left it in until it was golden brown. As part of my mash-up, I sliced some of my lemons as thin as I could with my knife, which proved to be easier if they weren’t the same lemons I had zested. 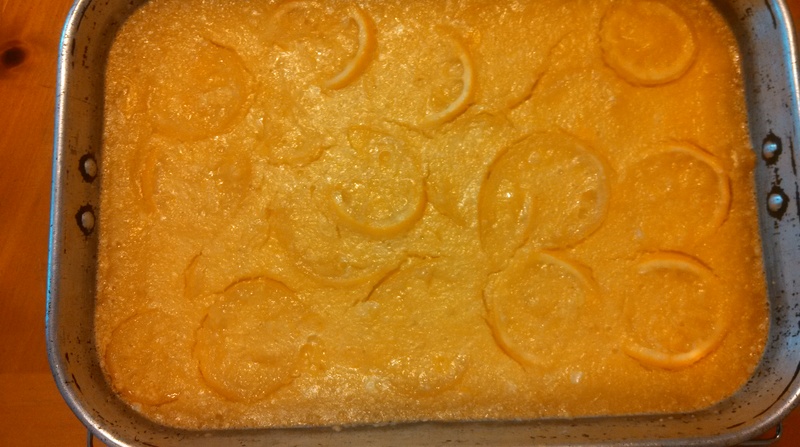 I then tossed them in the zest and sugar and let it sit while I mixed up the rest of the lemon filling. Gently combined them and poured it onto the crust, spreading out the slices evenly. They took awhile longer to bake than the recipe said they would, with the outer inch finishing far before the rest. As far as taste goes, he had to be the judge of that, I’ve nothing to base it on. It was fresh and full of lemon flavor. He found parts of it to be bitter, but sifting some powdered sugar on top helped. One can tell the outer edge was overdone and the crust was a little off tasting (which I can’t figure out, unless the pan had something to do with it), but all-in-all, for a first attempt, it managed to hit the spot. I’d love it if some of you would comment and give me tips on how to improve the process. Citric acid? Pyrex? Anyone? This entry was posted in Dessert!, Uncategorized and tagged Baking, Firsts, lemon, mash-ups. Bookmark the permalink.